This is Bryce, Chantal and Noah on Valentines Day of this year. I did this one using a sketch from My Creative Sketches. I flipped the sketch around to fit the photo I wanted to use. The line of paper comes from Bo Bunny called Crush. What a beautiful layout! The color combination is wonderful. Thanks for participating in the sketch contest! I love the reds (and I think you do too!). 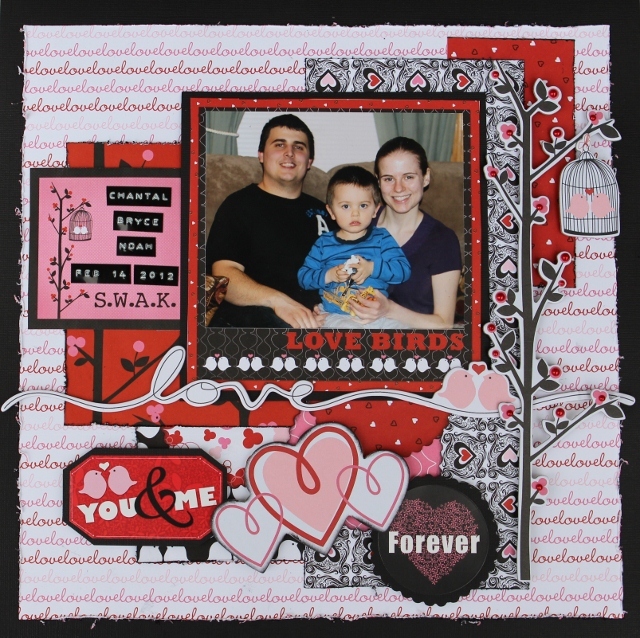 A great family photo adorned in the fantastic layout! OH - another lover of Bo Bunny papers! Love this - and you must have spent lots of time cutting things out? 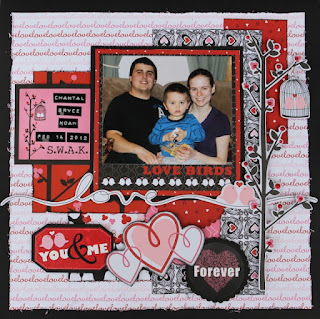 Thanks for the nice comment on my layout yesterday at Scrap Our Stash! Great take on the sketch. luv the bright colours! Thanx for playing at MCS! This is so cute! I love all the details and the layering! Awesome layout Sis! Fab take on the sketch, love how you have flipped it! Thanks for taking part. Beautiful page...I love your take on the sketch!! Thanks for playing along with us! !